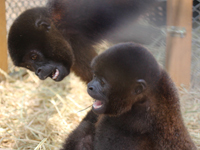 Baby woolly monkey Fausto has finally found the companionship he desperately needs and craves after being saved from the illegal wildlife trade in Peru. Torn from his mum, little Fausto is now in the care of ADI who have found the perfect companion for him – Panchita, an older female with whom he bonded immediately and the pair are now inseparable. Fausto was just 4 months old when he arrived at our Operation Spirit of Freedom rescue centre near Lima. Rescued from a restaurant where he was used to entertain guests Fausto, as with any baby, required round-the-clock attention and care. When ADI received news of another woolly monkey who had also been illegally trafficked and used in entertainment, we seized the opportunity to help her. When the mischievous and energetic Fausto was introduced to older and sweet-natured Panchita, the pair burst into joyful play, wrestling, tumbling and tickling one another, clearly delighted to be with someone of their own kind, understanding their language and sense of fun. Threatened in the wild woolly monkeys, like all primate species, are highly social and intelligent, and typically live in undisturbed forest habitats in large groups. Babies like Fausto would be fed by their mother for up to a year. Fausto and Panchita were relocated to the Pilpintuwasi sanctuary in April 2015, joining nearly 40 other monkeys, kinkajous and coati mundis - all rescued from circuses and the illegal wildlife trade across Peru. About Operation Spirit of Freedom: ADI has been assisting the Peruvian authorities to enforce the country’s ban on wild animals in circuses and has taken in many animals like Fausto and Panchita who have been seized from the illegal wildlife trade. Over 100 animals have been saved.